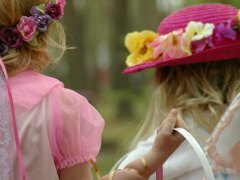 With over 40 events listed, this is the most comprehensive list of egg hunts and festivals in Allen, Frisco, McKinney, and Plano--limited to just Collin County so you don't have to drive far for fun! Easter dresses, Easter bunnies, egg hunts and tulips all seem to come together each Spring. Join in on one of these wonderful adventures in your town! For dates and details, click on the link or visit our calendar for a day-by-day listing. Are you afraid to attend some of these church-sponsored egg hunts or do you want to know more about what Easter means? Click here. Search for Easter Eggs at The Star in Frisco? Fun on the Tostitos Championship Plaza! The hunts will be staggered by age groups, 0-5 and 6-10. All will enjoy a two acre egg hunt along with a hayride, baby chicks, and a butterfly tent. Prior to the egg hunt, children are invited to learn about and receive their own Resurrection Egg during Super Church, while parents enjoy an uplifting Easter worship celebration. (Church participation optional.) Free. Egg hunt for those 21 years and older (wine will be served)! Have fun hunting in the dark for over 5000 eggs hidden around the museum property. Prizes range in value from from $1 to over $500 and come from from activities and experiences all over the DFW metroplex. Don't forget to bring a basket and flashlight! Doors open at 8:00 p.m. and the hunt will begin at 8:30 pm. Games, bounce houses, prizes and lots of candy! Egg hunt divided by age groups. Face painting, a petting zoo and egg hunts by age or grade level! Remember to bring your basket for the egg hunt. Food trucks. There will be bounce houses, an egg hunt, prizes, Cotton Candy, popcorn and more!! Free. The event aspires to bring esperanza (hope) to as many people as possible suffering the impact of extreme poverty in northern Mexico. This event is a first class athletic experience and festival that is enjoyable for the entire family, runners and non-runners alike. The free Family Fun Festival follows the run with free coffee and breakfast tacos, and bounce houses. Find the Golden Egg for a big prize at the Easter Egg Hunt on the lawn! Neighborhood children's event featuring prizes and treats, plus a goody bag for parents. Free. Egg hunt for children eight years and younger. This is NOT a free event, but price does include admission so stay for the day and enjoy hands-on demonstrations of carding, skirting, washing, dyeing and weaving wool; wagon rides; and free lemonade & sweet tea! Traditional egg hunt for children 5th grade and under. Bring your own basket and camera. Bounce house. Free. Residents, please check with your library for details on the event in your area. This event is currently not open to nonresidents. Ages 2-10. Bring a parent and an Easter basket to this truly unique event. Children will enjoy an Easter craft, refreshments, storytelling and an egg hunt. After the hunt is over, take pictures with the Easter Bunny. Limited to 100 participants, so register early. You must be registered to participate in this event. While the event location is just outside of Collin County, some residents of Sachse do live within Collin County and therefore these events are included. Bring your canine friend out to the park for doggie treats, prizes, a picture with the Easter Bunny, and contests for best dressed or cutest canine. Free. Children ages 2-10 come and see the Easter Bunny who will hide candy and special "prize" eggs for three age categories. Free. Bring your brightest flashlight to search for candy-stuffed eggs and the prized "golden egg". For children ages 5-13. Free. Of all the egg hunts, this may be the most exotic as kids get to hunt for their own eggs and watch the big cats get their treats! Easter Bunny, bounce house, face painting, games (prizes), snow cones and a food vendor. This is NOT a free event. Each step along The Passion Walk is designed to immerse you in the events preceding the resurrection of Jesus Christ. A printed guide will help you reflect and discover how the truths of Christ's life, death and resurrection impact your life today. Walk into the Upper Room. Sit and reflect in the garden. Hear a live rooster crow after Peter denies Christ. Weep at the foot of the cross. Smell the burial spices. Free. We respect copyrights and do not copy from other websites, so we kindly ask you to respect our copyright and not to copy this information. Realtors, you are welcome to link to this page. Thank you.